Uptown Consortium is dedicated to ensuring that Uptown residents benefit from new development happening in their neighborhoods, and Uptown organizations are answering the call. Partnerships prove that economic inclusion is more than possible in construction and development projects—more and more companies are stepping up to help Uptown residents play an active role in the changes in their community. A recent partnership between WEB Ventures, an inclusion consulting firm hired by Uptown Consortium, and RWB Construction serves as an example of how developers can include Uptown residents throughout their process. Photo courtesy of 2017 Scripps Media, Inc.
RWB Construction established a 12-week carpentry training program with $20,000 in funding from Cincinnati Children’s Hospital Medical Center’s Avondale Community Capacity Building grant. WEB Ventures vetted candidates and helped applicants enroll in the program. A class of 27 individuals was selected, with the promise of employment upon successful completion of the program. Participants met three times weekly to learn carpentry skills that would make them more competitive for future higher-paying jobs on local construction projects. Seven of the 20 new apprentices who graduated from the construction program this past December are current Uptown residents. All 20 graduates were hired full time by RWB Construction, Model Group or HGC Construction. The program’s success has RWB Construction considering a second class in the spring of 2018. Terrex Development and Construction participated in the collaboration by providing a site for the construction classes. Terrex, who is developing the Uptown Gateway in the Uptown Innovation Corridor in partnership with Messer, has invested significant time and resources into its economic inclusion efforts because it understands that developments have a real opportunity to positively affect the neighborhoods and existing residents. Story courtesy of UC Magazine. When it comes to biometric sensors, human skin isn’t an ally. It's an obstacle. The University of Cincinnati is developing cutting-edge methods to overcome this barrier without compromising the skin and its ability to prevent infection and dehydration. By making better noninvasive tests, researchers can open up enormous opportunities in medicine and the fitness industry. Heikenfeld, director of UC’s Novel Devices Lab, co-authored a critical review of sensor research in January with his students and colleagues for the nanotechnology journal Lab on a Chip, outlining both scientific accomplishments to date and challenges ahead. “We wanted to have all of the current progress and future directions and needs consolidated in one article,” said Andrew Jajack, co-author and a UC engineering student. 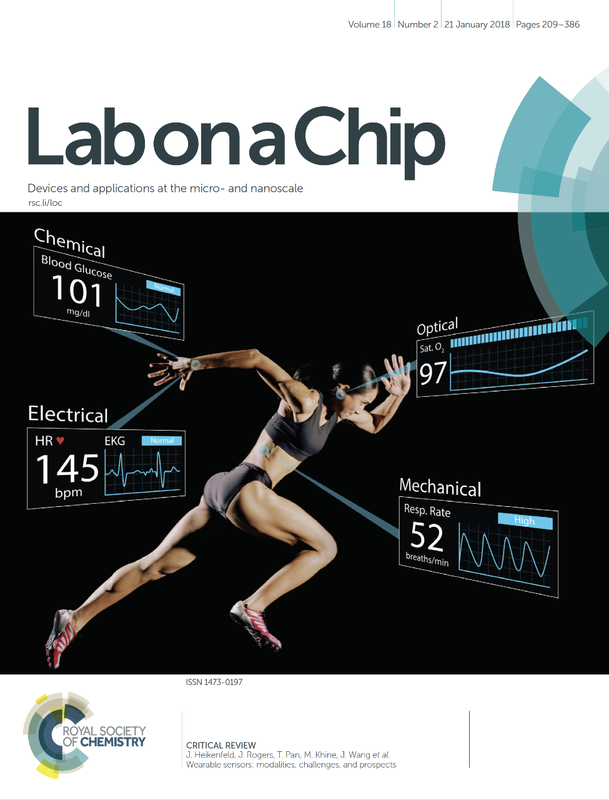 UC student Andrew Jajack designed the graphic depicting the four ways that sensors can record biometric data for athletes for the latest cover of the nanotechnology journal Lab on a Chip. Jajack designed the image and graphic that appear on the journal’s cover depicting the four ways that sensors can read biometrics in a track athlete. The article, co-authored by international leaders in biosensors, discussed the growing popularity of wearable devices such as Fitbit and explored the limitations of current technology. The skin can provide misleading data to biosensors because it harbors bacteria and tends to collect salt and other minerals from dried sweat. An effective sensor has to bend and stretch like human skin, even as it adheres to the surface when the subject is moving. Electrical sensors that track your heartbeat have to account for noise both from within the body or the environment, such as from nearby electronics. Heikenfeld said biosensors in most wearable devices use technology that has been available for years. UC has a long history with biosensors. The late Leland Clark Jr., sometimes called “the father of biosensors,” conducted research at the UC College of Medicine and Cincinnati Children’s Hospital Research Foundation. Among his many feats, he developed the modern blood glucose monitor that diabetics use today and the first sensors to measure a patient’s blood oxygen levels. UC’s research in sensors continues to be a pipeline for industry. Heikenfeld is co-founder and chief science officer for Eccrine Systems Inc., a Cincinnati company that specializes in sweat biosensors. Eccrine Systems announced this month that it won a $750,000 contract with the U.S. Air Force to study biomarkers from human sweat in real time. It marks the second phase of an initial research contract with the military. “We try to know other people’s business better than they do. You can’t innovate unless you are willing to dig way deeper than the competition,” he said. Eccrine Systems Inc. is working on new ways to track biometric information continuously over time. Students in UC’s Novel Devices Lab, located in the College of Engineering and Applied Science, are coming up with innovative ways to glean information from human sweat. These devices are the size of a Band-Aid and are worn on the skin like one, too. Students Adam Hauke and Phillip Simmers are working on UC’s next generation of sweat-stimulating sensors. These devices generate sweat on a tiny patch of skin — even when the subject is resting and comfortable — and wick it away to sensors that measure substances like glucose. The biosensors collect and concentrate the faintest amounts of sweat into samples that sensors can read. 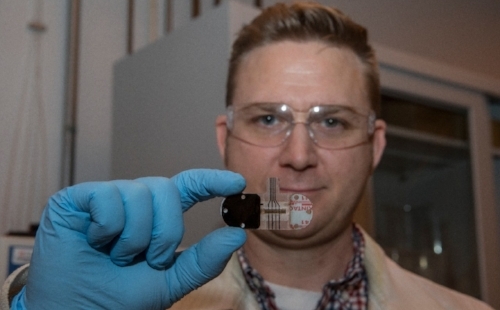 UC student Adam Hauke holds up the latest generation of sweat sensor in the Novel Devices Lab. Among its other capabilities, the device measures the galvanic skin response, an indication of how much someone is sweating, he said. “The more you sweat, the wetter your skin is and the electrical resistance goes down,” he said. The Society for Chemistry and Micro-Nano Systems recognized Hauke and Simmers with its Young Researcher Award last year for their collaborative study in continuous sweat sampling and sensing. In a different part of the Novel Devices Lab, engineering student Laura Stegner worked with a milling machine to customize flow-rate sensors. Across from her, classmate Amy Drexelius worked on the part of the device that can separate and concentrate the analytes they want to test in sweat or blood. “We want to concentrate the sample. So you can stick this on the front of your sensor and it does a lot of previously hard chemistry lab work for you,” she said. This technique could apply to other trace chemicals scientists want to measure, Jajack said. Heikenfeld said his lab’s success stems from its talented students, who apply their diverse interests and experiences to their lab work. Developing new sensors and applications takes problem solving that draws from many academic disciplines. Moving sensor applications from the lab bench to the store shelf remains a big challenge, UC chemistry professor William Connick said. He serves as director of UC’s Center for Biosensors & Chemical Sensors. “Groups like Dr. Heikenfeld’s are making remarkable strides in developing technologies that provide information on biomarkers at exceedingly low levels from very small quantities of fluid like sweat,” Connick said. Connick said demand for biosensors is only going to grow as labs like UC’s develop better ways to collect information. And home testing and continuous monitoring of drugs over time could lead to better health outcomes, he said. “The market is wide open now. The potential is gigantic, just in cost savings and being able to provide rapid screening without taking blood and having to send samples off to a laboratory,” Connick said. Heikenfeld’s journal article noted that biosensors of the future will measure multiple aspects of a person’s physiology. And new wearable sensors will need a mix of disposable and reusable parts to address the wear and tear that come with daily life. Now UC’s Novel Devices Lab is developing a new noninvasive technique to make sweat glands more permeable so sensors can record even more detailed data. Heikenfeld and Jajack are not ready to talk about how it works, but they are very excited about the possibilities.